While living in France as an art student, Meret Oppenheim made many unusual sketches for gloves. She designed gloves covered with fur in 1934 and gloves showing the hand’s bone structure in 1936. Elsa Schiaparelli’s fashion house also commissioned her to create sketches of gloves and jewelry, which offered the young artist a chance to earn some money. Bice Curiger, then editor-in-chief of Parkett art magazine, worked with Oppenheim to develop an edition of 150 pairs of Italian goat-suede gloves to be sold with a deluxe edition of Parkett issue no. 4, 1985. Oppenheim adapted a glove design she made in the early 1940s. 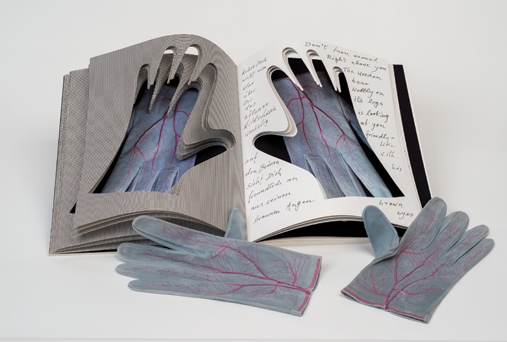 The network of red veins silk-screened onto the gloves attest to Oppenheim’s interest in making the invisible not only visible but also prominent, and wearable. Visit NMWA to see this and other Oppenheim works in Tender Friendships, on view through September 14. This entry was posted in Artist Spotlight, From the Curator, NMWA Exhibitions by Women in the arts. Bookmark the permalink.